Was it “acceptable” for Steven Soderbergh to shoot High Flying Bird on an iPhone? This is the paraphrased question that popped up on my Facebook newsfeed prior to the writing of this review. Surely, with movies like Unsane (Soderbergh’s previous film) and Tangerine coming to an immediate mind, we should be on our collective way towards “accepting” mobile-shot cinema. And yet, a theater-operating friend of mine suggested that, indeed, we are not on that path. Now, ignoring some questionable moviegoing experiences like watching a silent film ripped from a Youtube file — pixels blown up and all — this individual raises something interesting that relates thematically and even directly to the story and production of this new Netflix release. Almost everything about the film is structured towards change as a need and a must. From either end of the court, the ball must make it into the basket to eventually score a win. However, in this story, the game is played in wide-windowed offices, behind the bleachers, and on multiple screens. Sometimes the events are for all to see, unfolding on social media and via punditry. But, these perspectives are merely a facade and a play for something greater than the game itself: Change. A change in ownership, and thus a change in control, which has been considered “acceptable” to be in the hands of a few (white) businessmen for far too long. 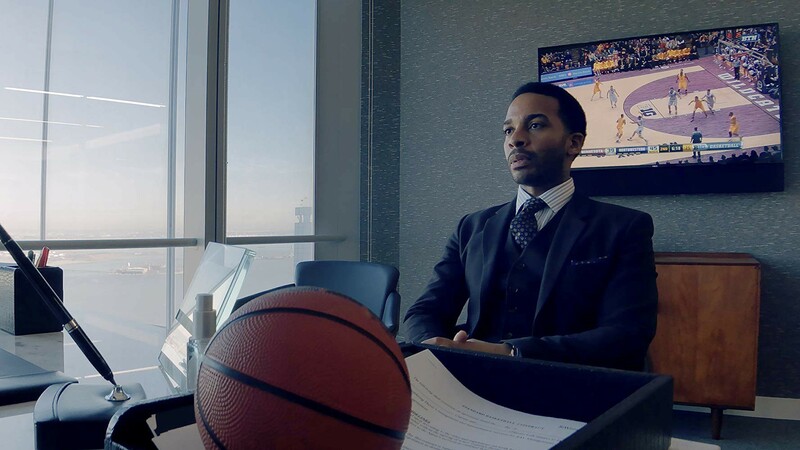 In High Flying Bird, an NBA lockout and its inevitable but meager exchange in split wages for the players, are seen by those in charge as necessary every couple of years. A balance, so to speak. Andre Holland’s sports agent supreme, trusted with a young athlete’s mentoring, isn’t just looking out for his client, but for every client. Holland plays this agent with whip-smart integrity and brass balls strategery, as he bobs and weaves his way past and through various obstacles and emotions, making himself into a contemporary revolutionary behind the revolutionaries. Kyle MacLachlan plays a status-quo keeping representative for the NBA team-owners. Basically, a middle-man liaison for the plantation (Typing this would get me in trouble with Bill Duke’s school coach character for sure, but I think he’d understand too). The guy isn’t completely anti-union or even all-out/out-right “evil”, but his smirking veneer combined with the default definition of his position not only suggested to me how otherwise decent fellows can become obscured by “the game”, but also how entranced and ensnared we all are in accepting this as something to be ok with. We should never just be “ok”. Complacency can be a creative (and literal) killer of sorts. A Scribe Called Quess and the krewe at Take 'Em Down NOLA mailed me the first volume of their new zine Roots Rising recently, which I’m currently in the process of absorbing. Two things stuck out to me upon opening: 1) A torn out note that I’m now using as a bookmark, with the words “Defective — Not For Sale” scrawled on it, and 2) An article within that lists factoids on the Civil War being one inflicted on the poor by the wealthy. In my mind, these two elements contrast well and connect to High Flying Bird in a unique and serendipitous way; Recognize control, break from it, and move forward. Effortlessly fun and witty, clever and pulse-poundingly crowd-pleasing, High Flying Bird is also not above or beyond reasonable critique. While it represents a democratizing of filmmaking, the iPhone is also a product, made outside of this country, and potentially by workers making little to nothing for long hours at a time. Thus, might this movie be a front door commercial for Apple? Yes. Can it also be a backdoor lesson in using control against itself? Absolutely. The reality is that we work within our means. Our few, monopolized means. But that work can flip the world upside down, and for the better. Soderbergh directs a script by Moonlight’s Tarell Alvin McCraney as if driven completely by an urge to break then reassemble the very motion of the images being streamed. Forget that this is a Netflix film for a moment, and focus on the delicate nature of its iPhone video capturing. In one scene, Holland is sitting across from his boss, who seems to be continually drinking product placed Vitamin Water (an in-story prop and probably an actual ad within the film). Once, he places an object on his desk carefully but ends up violently disturbing both the graceful stillness and framing of the camera’s shot, shaking it up for a few seconds. An Orson Welles “happy accident”? I think so. The resonance changes, becoming about something more than two men talking contracts. Suddenly, we’re thinking about how the whole thing is being rendered: By an iPhone on a small tripod. And we’re watching it on Netflix, a service we pay roughly $10 per month for. For all of its ninety minutes, High Flying Bird is a commanding force, instigating provocation of and directly encouraging serious thought. Thoughts range from our place amongst these systems of control and how we can become dismantlers and disruptors. Not everyone can negotiate deals with high-level agencies and go over legal mumbo-jumbo with ease, but most of us do have access to phones. Phones with cameras. Phones with editing tools. Phones that connect to the world. The next Coppola could very well be a kid with a dream to catch and a machine in his or her pocket. Not “acceptable” yet? Sorry, but we’re already there. Move on, or get left behind in the dust from my fashionable, cheaply made, expensive, and inspirational sneakers.